Mat is a writerly friend and a past-president of the Sudbury Writers’ Guild. 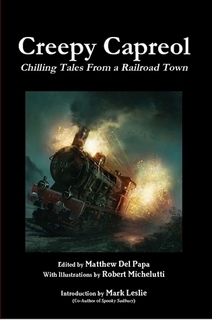 He’s published two collections of stories loosely based on the history of the railway in Capreol, and now, he has become an editor, assembling fact and fiction to create Creepy Capreol, a collection of supernatural tales about his hometown. Welcome to Writerly Goodness, Mat! WG: What inspired the Creepy Capreol project, and how did it evolve? MDP: The inspiration came from Spooky Sudbury. Mark Leslie and Jenny Jelen put together a great book and I was fortunate enough to be involved in a small way. That got me thinking about doing something more scary than my usual. Seeing the phenomenal success they had combined with the unexpected discovery of two other stories about Capreol in Spooky Sudbury to give me another push. Mark provided the final impetus. We’d been joking, via email, about the various weirdness in Capreol (the river’s burned twice and the fire hall three times — for a example) and he said something like “You should write a book.” I forget who came up with the title, him or me, but it clicked. WG: How did you go about recruiting your writers and artist? How smoothly did that process go for you? MDP: I recruited the writers I thought would the best fit first — current and former Capreol residents who already write genre-type stories. Steve Vernon was on top of that list. Born and raised in Capreol he’s had a great deal of success writing horror. Next came Jason Shayer, another Capreol boy who’s gone on to bigger things. Both were happy to contribute and their inclusion gave me the confidence to move forward (until they signed onboard I was more or less toying with the idea — getting two published authors was the final push). It would have been a thin book though if I hadn’t approached a few members of the Sudbury Writers’ Guild. Betty Guenette wrote about her uncle from Milnet (a ghost town just north of Capreol) and gave me a second story set in Sellwood (another nearby ghost town). Lisa Coleman-Brown had impressed me with her ability to write gross fiction and she delivered another stomach-churner for Creepy Capreol. The artist proved easiest of all. Robert Michelutti lives in Capreol and volunteers at the local train museum (the Northern Ontario Railroad Museum and Heritage Centre). I’ve had dealings with the museum before (they sell my previous books in their gift shop) and so had an “in” with Bob. I sent him some samples stories and he sent me some sample art — they proved a great fit. WG: Once you had the writers lined up and their stories in hand, it would have been time for editing. What did you learn from wearing the editorial hat that you may not have known as a writer? MDP: Editing is hard. Everyone knows that. What I didn’t realize was how many little details there were. Things you have to keep track of at all times. It’s like juggling — only you’re dealing with people and their creations! Getting the best work sometimes meant stepping on toes. I found a hundred ways to say, politely, “Try again. You can do better.” The amazing thing is . . . the various contributors did do better, every time, revising until we both were happy. No doubt they came to curse my very name, but the final product proved the efforts (and swearwords!) weren’t in vain. WG: Did you do the layout work yourself as well? How was it organizing text and images for publication? MDP: I did just about everything — that’s the only way to keep costs reasonable. Luckily there are plenty of quality programs and templates available. It probably took me ten times as long as a professional, but in the end everything came together. The hardest part was balancing the content. I agonized over the order, trying to compliment each story with the one before and after. WG: What is it like to create a project like this and have a hand in it from start to finish? MDP: Satisfying . . . and frustrating. I enjoyed 99% of the process. But that last 1% had me almost tearing my hair out. I can live with the odd technical glitch. It’s my own stupid mistakes that gall. Luckily I’ve done the whole self-publishing thing three times before and have learned from most of my mistakes. Having contributors was a new experience. One I found both difficult and exhilarating. Their enthusiasm pushed me through some rough patches, but waiting on others to revise (in some cases four or five times before getting it right) was a challenge. The fact that I’m not the best time manager meant that the last few weeks were a tight crunch. Still, for all the struggles, the final product turned out better than I could have hoped. WG: What’s coming up for Creepy Capreol? MDP: First comes the official launch. I always hold a book-signing/launch as part of the Capreol Days festivities (held on the August long weekend). This summer is no different. I’ll be in downtown Capreol on Saturday, August 2nd with a table of books — Creepy Capreol will be selling at a special holiday price of $14.00 — and encourage anyone interested to come out. There’s music, barbeques, a sidewalk sale — last year had horse rides, kids games, an animal exhibit — and more. After that I hope to hit Valley East Days in early September. It’s another fun weekend, full of music, food, and entertainment. The book should be available on Amazon in the fall. Kobo, Kindle, and iBookstore versions are coming soon. And I hope to have it in Chapters Sudbury location for October. Thank you for taking the time to tell us a little about Creepy Capreol and your journey to publication. That Darn Sock Monkey — How a stuffed sock monkey traumatized my youth. Bigfoot Lives! — A look at the Capreol connection to the famed creature; with references to fact, legend, and some personal observations. Help! My Wheelchair Is Trying To Kill Me — Humorous take on the many times I’ve almost been killed by my wheelchair. Mostly true, some exaggeration for effect. Vigilante Justice: Capreol Style — An account of Frederick Chase Capreol’s many failings and lone stellar success. It is mostly factual, but with some humour. The Mystery Of Capreol’s Mass Grave — Fact-based article that refutes the commonly held belief that between 30 and 80 people are buried in a mass grave. The Wreck At Drocourt — A poem by Ida Quackenbush and her son George. Originally written approximately 1930. Ghost Town Trilogy — Loose histories of three local ghost towns. Set in Capreol’s railyard the story revolves around one man’s late-night encounter with the supernatural. An overworked PSW is filling in for a co-worker when she discovers a disturbing secret. A literary mystery; it features a vicious murder in a bookstore — with a novel twist. The bond between nephew and uncle are tested as more than age and isolation separate the two. A northern Ontario fish story as told by the bait dealer who saw it all happening. Ghost towns aren’t always empty. Two sisters find this out in traumatizing fashion on a visit to Sellwood. Exploring abandoned buildings reveals something unexpected … and evil.